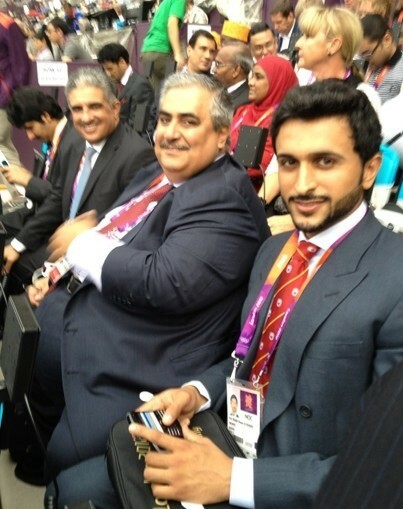 With all the fuss over the empty seats at the Olympics, it's worth noting one man who is attending the Games: Prince Nasser bin Hamad Al Khalifa, photographed above, foreground. Nasser represented Bahrain in the National Endurance team at the Asian Games and according to ECCHR launched "a punitive campaign to repress Bahraini athletes who had demonstrated their support (for) the peaceful pro-democracy movement" whereby "more than 150 professional athletes, coaches and referees were subjected to arbitrary arrests, night raids, detention, abuse and torture by electric cables and other means." Nice to he's received such a warm welcome in the UK.